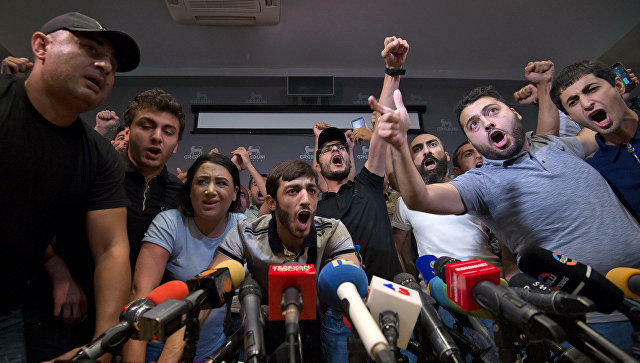 Armenians protesting against their former President Robert Kocharyan’s recent release from detention broke into the hall where his press conference was supposed to begin, Armenian media reported on August 14. Thus, the press conference of Kocharyan was cancelled. The date of the new press conference is still unknown, head of Kocharyan’s office Viktor Soghomonyan told Armenian journalists. However, the protesting Armenians did not stop there – they later held a protest outside the Prosecutor General’s Office and demanded to appeal Kocharyan’s release. “We demand from the Prosecutor General’s Office to appeal the decision of the Court of Appeal as soon as possible,” said one of the participants. Then the protesters went to the Republic Square in the center of Yerevan. Kocharyan was previously charged with overthrowing the constitutional system in preliminary collusion with other persons. He was summoned as a witness to the Special Investigation Service of Armenia for questioning in the case concerning the bloody events in Yerevan streets on March 1, 2008, when 10 people were killed in mass protests after the presidential election of that year. Later, Armenia’s judicial power issued a decision to arrest Kocharyan for two months. However, his lawyers appealed the arrest to the Court of Appeal, which overturned the decision of the court of first instance on the basis of the immunity of the former president. The Special Investigation Service of Armenia is convinced that the decision on the release of Kocharyan is illegal. “We hope that the Prosecutor General’s Office will appeal this decision to the Court of Cassation,” the state agency told media. Within the same case, charges were also brought against former Defense Minister of Armenia Mikael Harutyunyan and CSTO Secretary General Yuri Khachaturov, who was the head of Yerevan garrison in 2008. Khachaturov was later released on bail, while Harutyunyan is still wanted.